When you have a will you are already the type of person who knows it’s never too early plan for the future. You know that an accident might happen at any time. You know that unless you’re prepared, your loved ones may be left struggling to deal with your estate. That’s why you got a will. However, once a will is created, it’s not necessarily done for good. Your family may have changed. People may have passed away or moved on from your life. Or your financial situation may have evolved. We recommend that you review your will every three to five years. If things in your life have changed, it may be a good time to update your will. 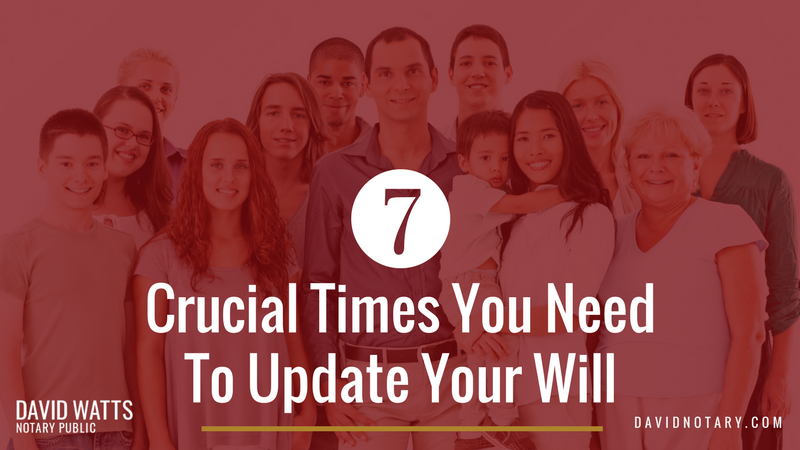 Here are 7 reasons why you should consider updating your will. Becoming a parent is one of the main reasons why people get a will in the first place. A will can allow you to name a guardian for your children and help you provide for them financially if something happens to you. If you wrote your will before becoming a parent, or if your family has grown to include more children, you should definitely consider updating your will. Doing this will ensure that everyone is taken care of and that your estate is divided equally among your children. The arrival of a new grandchild is rarely met with the thought of immediate succession planning, but it’s important that you update your will whenever this happy event happens. Many people like help grandchildren with the cost of education or buying a first home. Updating your will allows that each of your family is taken care of when you pass away. When you lose someone, especially an executor or a beneficiary, it’s time to update your will. If your spouse passes away, you may need to update your will to reflect this. This change will ensure that you control how your estate gets divided among all the other beneficiaries to your will. You should also review your previous “alternate” plans are now consistent with what you wish to be your primary plan. Without changing your will, you can subject your family to legal battles with an old spouse who is still your executor or beneficiary. This can make an already difficult time very stressful. If you are in this situation, update your will immediately. Wills usually name an executor who is responsible for carrying out the instructions laid out in the will. This person is in charge of completing an inventory and valuation of all assets and debts. They also gather the names and addresses of all beneficiaries and next-of-kin, and wrap up your personal matters (among many others). This person plays a central role in ensuring that your wishes are respected once you pass away. It’s important to make sure that they are still up for the task. They moved to a different country. Your relationship has changed and it’s no longer appropriate. Someone else is a better choice. Changes in your financial situation are another good reason to update your will. Regardless of whether these changes are positive or negative, they affect the way in which you want to divide your estate. Positive changes may motivate you to include more people in your will, while negative changes may push you to prioritize. Laws change all the time, and they may affect the validity of your will. For example, a few ago the B.C. legislature amended the B.C. Wills, Estates and Succession Act (WESA), creating major changes in the ways in which wills were drafted and executed. These changes may render your will invalid or alter the way it is interpreted. If your will is over two years old, you may need to have it updated. If you think that it is time to update your will or want to find out how to proceed, speak to a BC Notary or a lawyer. As you revise your succession plans, it’s important to get the right help to make sure that your new will meets all legal requirements. BC Notaries and lawyers can also help you make sure that the will reflects exactly what you want to happen if something happens to you. Get in touch if you have questions or need help with your will.